My goodness, I’m nervous as I write my first “beauty” post. Even though I’ve always been conscious about sunscreen, moisturizing and cleansing, I’ve always kept my routine to a minimum. And one more thing, I’ve never gave importance to the TONER. So, without further delay here’s the products that I’ve been using on a daily basis for quite some time now. 1. Clarins Instant Eye Make-Up Remover – I find this the best in removing waterproof and/or stubborn eye make-up, I have also used in the past Lancome BI-FACIL – Double-Action Eye Makeup Remover which is also good but not as good. Another product that I’ve tried is Estee Lauder Gentle Eye Makeup Remover. It removes everything with the exception of mascaras, even the non-waterproof ones. 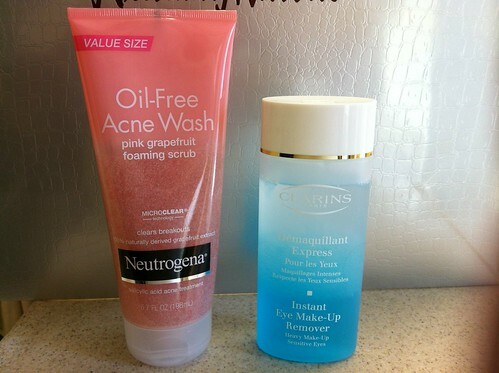 So now I’m back to using Clarins as it is by far the best in removing everything. 2. Neutrogena Oil-Free Acne Wash Pink Grapefruit Foaming Scrub – this product I have been using for the longest time and has never failed me. I’ve used proactiv before and I don’t like it. It made me breakout more. So until this product gets discontinued, I don’t think I will change this part of my routine. 3. 3LAB Perfect Balancing Toner – according to the website it is “a gentle, skin-softening, pH regulating toner formulated with Sodium Hyaluronate to avoid skin drying from wash. Fragrance free, alcohol-free.” I’m sold 🙂 I like the feeling that it leaves after I apply the toner. It actually leaves my skin supple after application. 4. 3LAB Hydrating-Vita Cream – according to the website “This vitamin-rich, moisturizing gel is light in texture but serious when it comes to skin protection and maintenance. It contains a replenishing complex that prevents moisture loss and provides the skin with up to 24 hours of hydration. Packed with potent antioxidants, it delivers essential nutrients to help plump the skin while antioxidants like Vitamins A, C & E treat dryness and restore skin to its optimum health. Best for use on dry to normal skin this is the perfect solution for dehydrated skin.” I find this works on my combination-oily skin even during SoCal winter. 5. Lancome Genefique – it boasts that in 7 days my skin will look younger. Well, it did. Well, to begin with I don’t really have lines or wrinkles. My only problem is the hyper pigmentation from acne scars and pores on my nose and the skin immediately surrounding it. If anything, my face is “glowing” nowadays without makeup. My supply right now came from Sephora’s 100 point perk and I availed of the opportunity to “hoard”. So now I’m good for at least 7 weeks (that gives you an idea how many points I have on my bank at Sephora’s, yikes!). 6. Lancome Visionnaire – I have such high hopes in this product because it boasts that “on the surface, wrinkles* and pores* are visibly corrected, imperfections like signs of UV damage and acne marks appear diminished.” I have only been using this for a week so we’ll see in 3 more weeks where we stand. 8. Le Metier de Beaute Peau Vierge Anti-Aging Complexe SPF20 in Shade 03 – this is the last step before I can call my face “ready”. Ready to go out or ready for makeup. 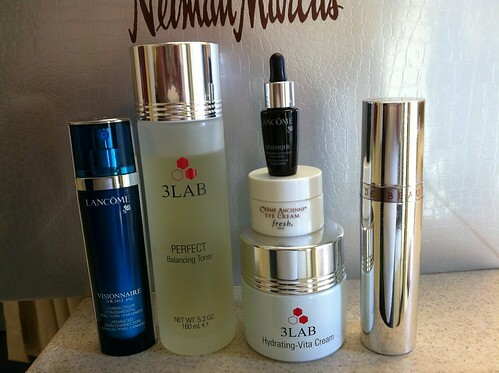 Nowadays, at my age, I will not allow my face to go out stripped and unprotected. This is a tinted treatment formula with Retinol and SPF 20 delivered via the “Syntoc Actif ® technology which is clinically proven to be 20 times more effective at delivering active ingredients into the dermis layer of the skin than traditional topical applications”. It has a luminous, dewy finish when applied. So that’s my daily skin care routine which I do twice a day (am and pm) with the exception of LMdB Peau Vierge at night. it’s here!!! there’s no turning back…before jumping on to makeup and all things pretty, I’ve got to start with the basics. Like “my daily skin care routine”. Hi, so sorry it took me forever to reply. Unfortunately I did not receive email notification of your comment. You are welcome to use my pics with credit of course and also let me know if you do so with a link so I can post the link on my social media as well.